Denn Verarbeitung - Beständigkeit - Bedienbarkeit und Werterhalt sind hier unübertroffen. Über viele Jahre und Jahrzehnte hinweg ist GARRETT der führende Anbieter für Detektoren aller Art weltweit. GARRETT Electronics Inc. wurde im Jahre 1964 vom Ingenieur und Geschäftsmann Charles L. Garrett gegründet. Nach Abschluss seines Ingenieursstudium im Jahre 1959, entwickelte Charles Garrett für das NASA Weltraum-Programm elektronische Bauteile die bei der ersten Mondlandung eingesetzt wurden. An den Wochenenden verbrachte Charles viele Stunden damit, seiner Leidenschaft, der Schatzsuche nachzugehen. Von den damaligen Geräten nicht überzeugt war er sich sicher, dass er bessere und qualitativ hochwertigere selber entwerfen und bauen könnte. Im Jahre 1964 stellte er sein erstes selber entwickeltes Hobbygerät vor und verbrachte viele Nächte in seiner winzigen Garage in Nord Texas um dieses Modell zu verfeinern. Im folgenden Jahr, mit nur $1000 Startkapital und Unterstützung seiner Frau Eleonor, kaufte er genügend Teile um 25 Detektoren herstellen zu können und schaute nie zurück. Und das bis Heute. Von Anfang an war die Technologie von GARRETT in dieser Branche wegweisend. Es folgten Neuheiten und Patente wie z.B. „Zero Drift Circuity „ 1971, dann der „ Dual-coil BFOD Discriminator" 1973 und das „ Gravity Trap® Gold Pan" 1975. Die Firma reinvestierte fast all seine Gewinne - so wie wir auch ;-)) - in neue Produktentwicklungen. So entstand eines der weltweit grössten industriellen Entwicklungszentren für Metallsuchgeräte. Gegen Ende der 70 Jahre war es GARRETTs Ingenieuren bereits klar, dass es für wirklich neue und perfekte Instrumente neue Technologien benötigt, welche auf wissenschaftlicher Basis und der aufkommenden Computertechnologie basieren. Die Beharrlichkeit und zukunftsorientiertes Denken der Ingenieure zahlte sich 1982 aus. GARRETT stellte das erste auf Mikroprozessor basierende Gerät vor und wurde prompt mit einer Auszeichnung versehen. Das US Patent No. 4,709,213 prägte die Firma und es entstanden komplett neue Möglichkeiten und Geräte. Es resultierten neue Technologien wie z.B. GTA (Graphic Target Analyzer) und Master Hunter® CX Detektor Serien daraus, welche mikroprozessorgesteuerte Schaltungen enthielten und noch nie da gewesene Sensibilität, Tiefenleistung und Präzision erzielten. Ständige Weiterentwicklung und Updates, gleichbleibende Qualität und Zufriedenheit seiner Kunden sind das Hauptziel von GARRETT und seinen Mitarbeitern sowie auch deren Händlern. Charles Garrett enlists in the U.S. Navy and attends a 6-month Electrician's Mate School, which begins his formal education in electronics. He quickly advances to the rank of Electrician Mate 2nd Class Petty Officer and is placed in charge of the 14-man electrical department on board the USS Bottineau (APA 235), an attack troop transport, during the Korean War. After his service in the Navy, Charles Garrett marries Eleanor Smith of Pennington, Texas. Eleanor is an elementary school teacher with the Nederland, Texas, school system. Garrett enrolls at Lamar University in Beaumont, Texas, and begins working towards his Bachelors of Science degree in electrical engineering. Following Charles' graduation from Lamar University, the family moves to Dallas, Texas, where Garrett begins working for Texas Instruments. He becomes an integral part of the company's Space and Electronics division and helps design the solid-state amplifiers and power supplies for a data encoder which is used in the Mars-bound Mariner II spacecraft. He also designs the electronic radar scanning templates and controls for the F111 aircraft. The Garretts move to the Garland, Texas, area where Eleanor continues her school teaching career and Charles accepts a position as Project Engineer with the Geotechnical Corporation. He becomes heavily involved in several earth science related projects. He helps develop advanced seismograph circuitry that is planted on the moon by Neil Armstrong in 1969 to detect moon quakes and other seismic disturbances. Garrett develops several other earth science related devices. Charles Garrett rents commercial metal detectors and finds them unsatisfactory. He begins work in the garage of his Garland home to design, develop and build better ground search metal detectors. Eleanor and Charles Garrett establish their business April 1, 1964. Garrett introduces the dual searchcoil Hunter, his first metal detector, to the market (retail price $145.00). By 1967, Garrett competes with more than 35 companies who have a standing history of manufacturing and selling metal detectors. He recognizes early that his detectors must offer better searching capabilities than those available from his competitors. Garrett continues to improve his metal detectors by traveling with his family to field test his inventions. Garrett sets up his first hobby trade show booth at the Prospector’s Club of Southern California, which captures the attention of the best known treasure hunting talent in the country. Garrett establishes the first distributor outlet, “Bowen’s Hideout,” a store owned by Harry and Lucille Bowen, in Spokane, Washington. Realizing the tremendous value of a distributor network, Garrett begins placing ads to set up dealerships across the country. Garrett becomes the first manufacturer to eliminate oscillator drift. He also designs and patents his revolutionary, independently-operated searchcoils which greatly improve treasure hunting efficiency. Garrett is also the first to overcome searchcoil drift by inventing (and patenting) a special coaxial searchcoil winding technique. The Zero Drift Revolution sparks a movement towards an industry-wide effort to create technology that competes on the same level as Garrett's new detectors. Garrett Metal Detectors moves into a new 15,000 square foot facility and begins increasing production of its more sophisticated products. Garrett introduces the first low cost metal detector - The Mini Hunter. Garrett introduces its first TR (Transmitter-Receiver) metal detector. The Gravity Trap Gold Pan is designed and patented by Roy Lagal of Lewiston, Idaho. Garrett begins worldwide distribution of this pan, which continues to be the world's most popular gold pan. Charles Garrett publishes his first book, Successful Coin Hunting, and RAM Publishing is born. Garrett designs his first push button retuning circuit. The editor of a national treasure hunting publication, The Association, contacts Garrett and offers to sell his detectors and gold panning products. He encourages Garrett to write a series of articles about his adventures, metal detection designs, hunting tips and advanced electronics precious metals locating technology. Garrett's engineering team, with Bob Podhrasky as chief engineer, begins rapid expansion into the Very Low Frequency (VLF)/TR ground mineral cancellation discrimination instruments. Garrett coins the term VLF. Garrett introduces the original GroundHog VLF/TR prospecting and general purpose detector. As gold prices soar, treasure hunters clamor for Garrett's detectors in the United States and internationally. Garrett receives requests to establish international dealerships. A treasure hunter based in London opens the first dealership outside the United States. Peter Bridge opens the first Australian dealership. By the mid-1980s Garrett Metal Detectors becomes one of the largest metal detector manufacturers with over 1,800 distributors worldwide. Garrett introduces the Sea Hunter, an underwater pulse induction metal detector. Garrett establishes The International Treasure Hunting Society, formed to bring treasure hunters together. This society soon sponsors the largest international treasure hunt ever conducted. The five-day treasure hunt takes place at the 120-acre Trader's Village Market located in suburban Dallas. Over 2,000 treasure hunters attend and over $100,000 in prizes including a pick-up truck, are given away. Hundreds of ardent admirers visit Garrett's factory in Garland that year. 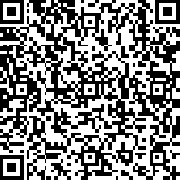 A free newsletter is published, which is distributed throughout the treasure hunting world. Garrett's article series, which focuses on his treasure hunting successes as well as personal search and recover techniques, greatly increases interest in Garrett detectors. 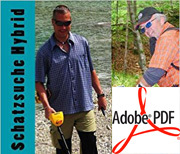 He continues writing for the metal detecting and electronic gold prospecting industries. Garrett introduces a motion discrimination metal detector. Garrett conducts seminars to teach Utah Fish and Wildlife authorities how to find bullets in animals that had been killed by poachers. This seminar proves to be Garrett's first official law enforcement seminar, which has grown into The Garrett Academy of Metal Detection. 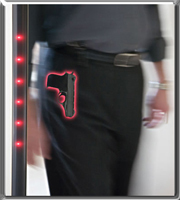 Garrett is awarded the first U.S. patent for the use of microprocessors in metal detectors. In September, Garrett is invited to develop a walk-through metal detector for the 1984 Summer Olympic Games in Los Angeles. The tragedy of the 1972 Munich Games created an intense movement for increased security at the Olympics. By April, the engineers at Garrett Metal Detectors are working overtime to create the MagnaScanner, the company's first walk-through metal detector. That same month, Olympic Games Head of Security Ed Best visit's Garrett's offices to test and approve the new detector. That year marks the first extensive metal detection screening efforts in the history of the Olympic Games. 60 walk-through detectors and 1,000 of Garrett's Pocket Probe hand-held detectors, as well as training, are supplied to the Olympic Games. The hand-held SuperScanner, one of today's most recognized security products, was first used at this event. Garrett supplies 1984 National Republican Convention in Dallas, Texas, with security metal detectors. Garrett provides security training and products for the Egyptian Ramses Exhibit. Garrett provides security training and products for the PanAm Games in Indiana. Vaughan Garrett begins utilizing his video production expertise to create educational treasure-hunting and security videos. Garrett provides security walk-through and hand-held metal detectors for the Seoul, Korea, Olympic Games. The Grand Master Hunter is introduced as Garrett's first microprocessor detector. Garrett introduces the first Graphic Target Analyzing (GTA) microprocessor-driven detector with multiple notch discrimination for treasure hunting. This notch is still the most efficient and desirable metal detector target discriminating method. Garrett provides security training and products for the U.S. armed forces in Kuwait during the Persian Gulf conflict known as Desert Storm. Garrett provides security metal detector training and products for the Barcelona, Spain, Olympic Games. Garrett moves company headquarters and detector manufacturing to its current location on 1881 West State Street in Garland, Texas. Garrett introduces the world's first talking metal detector. Garrett introduces the Graphic Target Imaging (GTI) metal detector with Digital Signal Processing (DSP) and true target size and depth for treasure hunting. 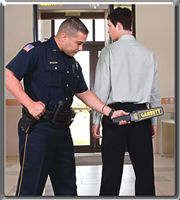 Garrett provides security metal detector training and products for the Atlanta, Georgia, Olympic Games. The Garrett Academy of Metal Detection is formally established to offer certification in the use of metal detection equipment in checkpoint screening applications such as airports and special events. Garrett provides security metal detector training and products for the Nagano, Japan, Olympic Games. Garrett introduces the PD 6500 Pinpoint walk-through detector, with multi-zone detection. Garrett provides security metal detector training and products for the Sydney, Australia, Summer Olympic Games. Garrett introduces the SuperWand hand-held metal detector. Garrett provides security metal detector training and products for the Salt Lake City, Utah, Winter Olympic Games. Garrett supplies the SuperWand to all U.S. airports. Garrett introduces the PD 6500i walk-through metal detector with 33 distinct pinpoint zones including left, right, and center detection. Garrett becomes the only U.S.-based manufacturer to meet TSA guidelines for walk-through and held-held metal detectors. Garrett supplies walk-through metal detectors to one-third of America's airports and to many overseas airports. Garrett introduces the Infinium metal detector, engineered for greater gold detection depth in heavily mineralized soil and for use in water to depths of 200 feet. Garrett celebrates its 40th anniversary on April 1. Garrett introduces the Graphic Target Profiling (GTP) 1350 metal detector. Garrett introduces the ACE series, the most advanced, low-cost metal detectors in the world. Garrett's ACE 150 and ACE 250 detectors become top sellers in the United States hobby industry and successfully debut in European markets. Garrett is featured on John Ratzenberger's hit TV series Made in America, which airs on the Discovery Network's Travel Channel. Garrett installs 450 PD 6500i walk-through and 900 SuperScanner hand-held metal detectors at Olympic venues throughout Torino, Italy, for the 2006 Olympic Winter Games. Garrett Metal Detectors is honored with the Texas Manufacturing Assistance Center (TMAC) Award of Excellence. Texas Congressman Sam Johnson joins Charles Garrett and company officials for the groundbreaking ceremonies for the company's expansion. Construction begins at 1881 W. State Street in Garland to expand Garrett's facilities to 100,000 square feet. The new Garrett home office houses an enlarged treasure hunting museum, a formal conference/training center for The Garrett Academy of Metal Detection training, and enlarged production and warehouse facilities. Garrett provides walk-through detectors, hand-held detectors and training to the 2008 Summer Olympic Games in Beijing, China. 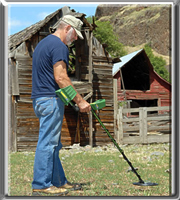 Garrett introduces the popular new PRO-POINTER pinpointing metal detector. Garrett is named the official security metal detector supplier for the 2010 Winter Olympic Games in Vancouver, Canada. Garrett launches a new Countermine/ERW division and introduces the RECON-PRO AML (All Metal Locator) 1000. Charles Garrett and a team of Garrett detectorists work with Texas Parks and Wildlife to recover and preserve artifacts from the San Jacinto battlegrounds where Texas independence was won. Charles, Eleanor and Vaughan Garrett and Vice President Bob Podhrasky serve as early Olympic torch runners during the countdown to the 2010 Vancouver Winter Games. Garrett provides security metal detector training and products for the Vancouver Winter Olympic Games. U.S. Congressman Sam Johnson visits Garrett's headquarters to present a copy of the Congressional Record in which Garrett was recently recognized. Garrett provides security walk-through and hand-held detectors for the 2010 FIFA World Cup championship soccer tournament in South Africa. Garrett releases new hobby detectors for the ACE series, as the ACE 350 in America and as the EuroACE for its overseas version. Garrett introduces the versatile AT Pro, a true all-terrain hobby detector which can be used for shallow water hunting. It includes an exclusive Iron Audio feature to identify iron trash and has a powerful new DD searchcoil to help overcome mineralized soil environments. Garrett releases the new Super Scanner V security hand-held screening detector, featuring both audible and vibrating alarm options.